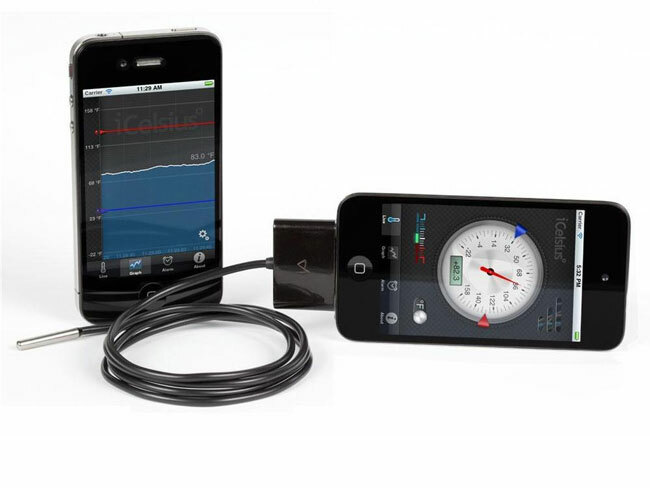 If you are looking for a gadget to track temperature using your iOS device, then the iCelsius is definitely worth more investigation. The iCelsius Pro thermometer probe has been designed to plug into the bottom of your iOS device and converts your Apple, iPhone, iPod or iPad into a digital thermometer. It comes complete with its own iOS application which can be downloaded for free from the Apple iTunes app store, and is used to read temperatures, create graphs, set up alerts and store or email data. The thermomoter probe uses a liquid which reacts much faster to changes, than mercury or alcohol. Which enables the device to provide temperature readings rapidly. The iCelsius Pro uses a 4″ stainless steel tip to report temperature readings through the iPad when the probe is in thermal contact with matter. Providing accurate temperature readings in the ranges of -22 degrees F to 302 degrees F (-30 degrees C to 150 degrees C).